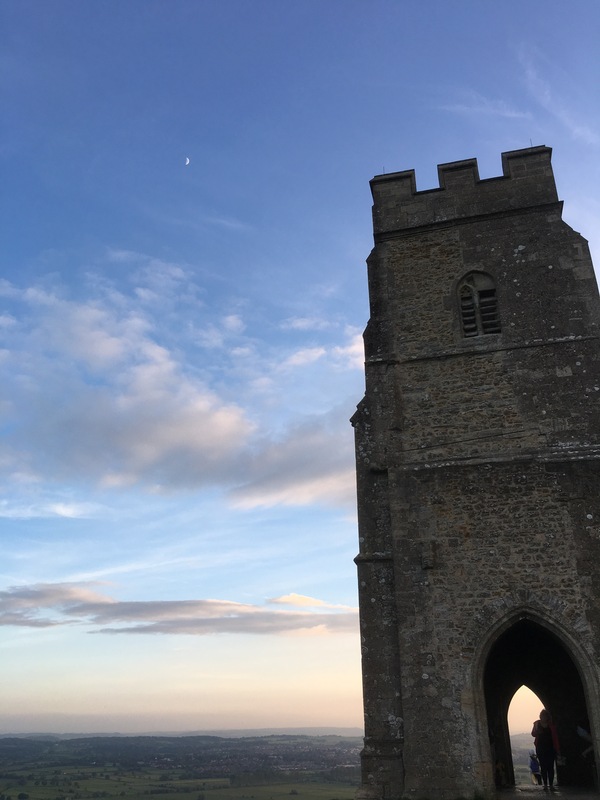 Once a year I throw a guitar and suitcase into the van and head for the glorious Somerset town of Glastonbury to take in the waters, recharge my batteries, and hang out with some of the most wonderful (and downright bonkers) people on Earth. This is the view from Wearyall Hill, overlooking the town. You can see the Abbey to the left and the Tor to the right. 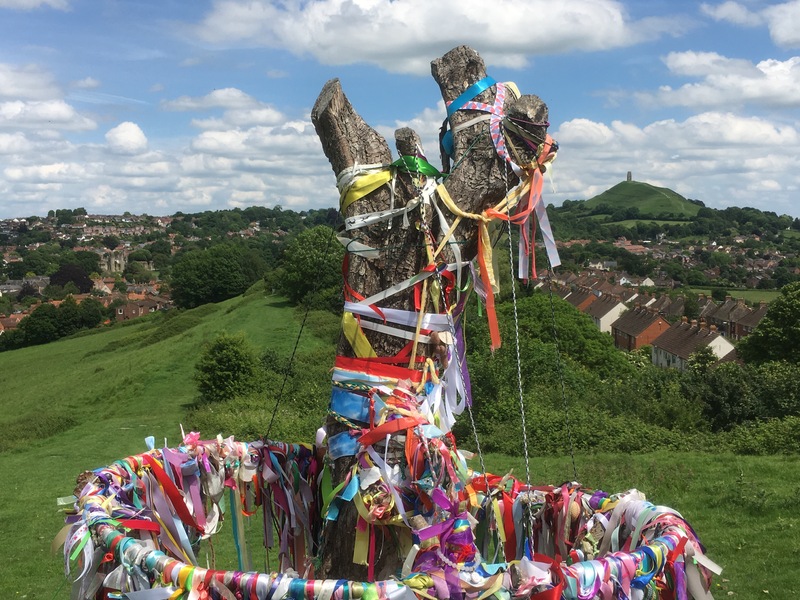 The brightly coloured object is the Glastonbury Thorn, draped in pagan ribbons (amongst others). Legend has it that much of this was underwater 2,000 years ago when Joseph Of Arimethea, Uncle of Jesus and a renowned trader in Tin, stepped from his boat and placed down his staff, which immediately burst into flower. 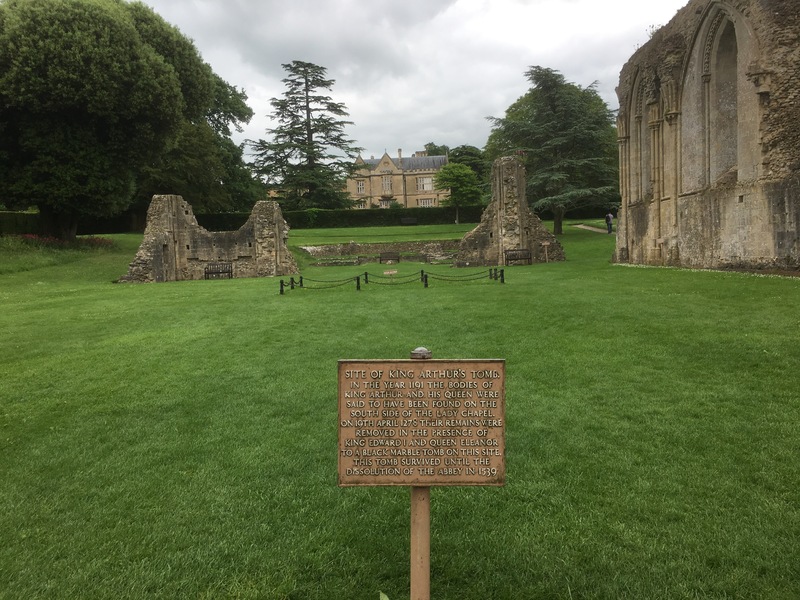 He then took this as a sign, went down from the hill and founded what would become Glastonbury Abbey, the first Christian Church in England. You can probably spot the flaw in this story, but hey, I’m a romantic, and much prefer a good legend to drab reality. Incidentally, the tree was vandalised in 2010, when some idiot chopped the top off. Some people have no sense of respect or history, eh? Here’s hoping that the restoration project’s successful and it’ll one day grow back. Here’s some of the remains of the Abbey itself, and if you zoom in you can make out the marker of one of History’s greatest controversies. 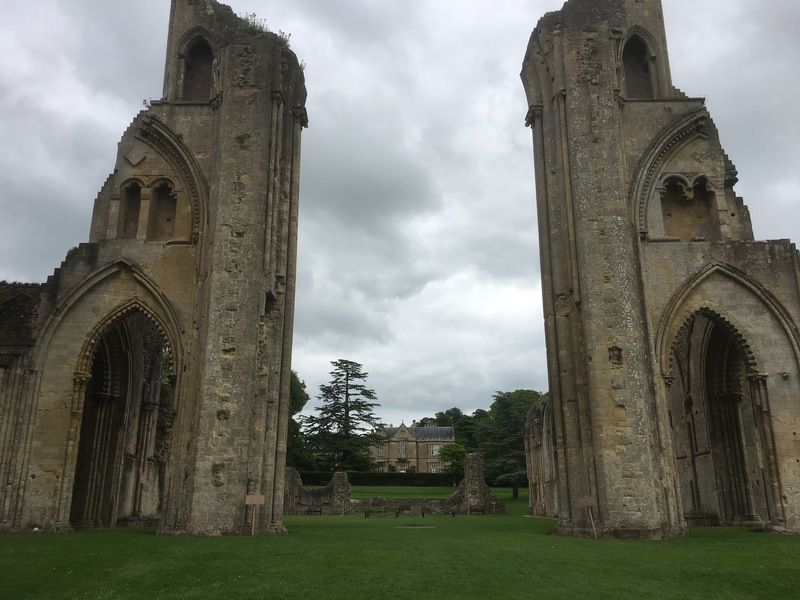 A couple of years after a fire burned most of the Abbey down, the monks dug down and allegedly found the graves of King Arthur and his Queen Guinevere, under a marked cross. A bit convenient, eh? The Abbey was sacked under Henry VIII’s dissolution of the monasteries in 1541 and pretty much became what it is now. Hell, you can even go and stay in the room that Henry’s alleged to have sat in as he watched the Abbey burn, in the George and Pilgrim hotel across the road. I heartily recommend the steak. 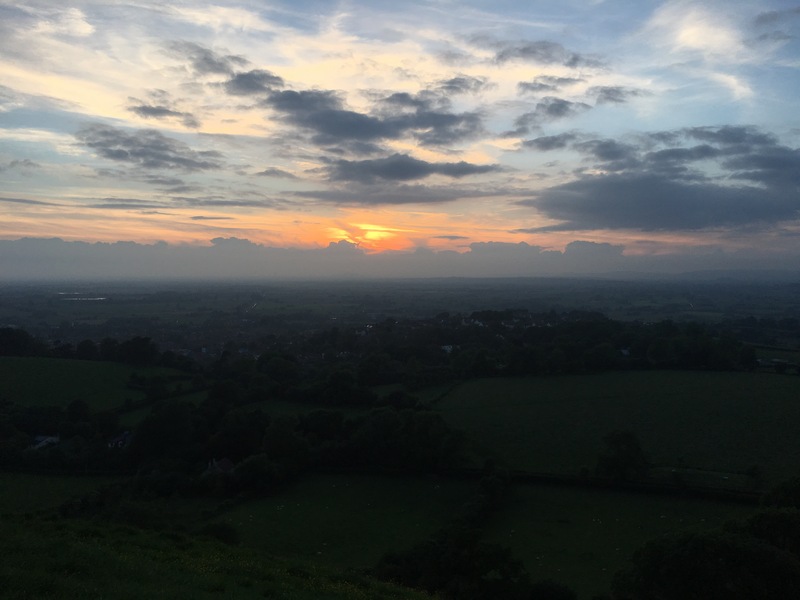 Here’s a glorious summer sunset as seen from Glastonbury Tor. One name for it is Ynys Wydryn, or the Isle Of Glass, which makes sense if you think of the surrounding countryside being underwater and gives rise to the Tor’s reputation as the Isle of Avalon. Home to Gwyn App Nudd, Lord of The Underworld, it’s associated with being an entrance to the land of Faerie, and you can’t deny the spiritual power of the place, especially if you spend a night there (take a WARM sleeping bag). As Dawn breaks and the mists of Avalon recede to reveal a rolling landscape, the power and potential of the new day is undeniable, an incredibly positive form of energy. At the foot of the Tor you’ll find the Chalice Well, though out of respect for this sacred place I’ve chosen not to include pictures here. Another legend regarding Joseph of Arimethea is that he hid the Holy Grail (the cup used at The Last Supper in which he caught the blood of Christ as he bled on The Cross), somewhere in the Earth below the Tor. There’s some deliciously tranquil gardens set around the well, excellent for meditation (or just chilling away your hangover), well worth the piffling entrance fee. I find the gardens to be the most relaxing place in Glastonbury, others may disagree. On the other side of the wall though, the water flows for free. If you’re a hopeful traveller like me, fill up your water bottle here. There are two springs across from one another, one male, one female. The male spring is the Chalice Well spring, which does leave a trace of red (you know the legend mantra by now) thanks to the iron traces in it. The female spring runs white, thanks to its level of calcium, and has its own sacred shrine in the shadow of the Tor. Both stand on a Ley Line, and show a little respect when you drink or fill your bottle. I like to take a mix of both. 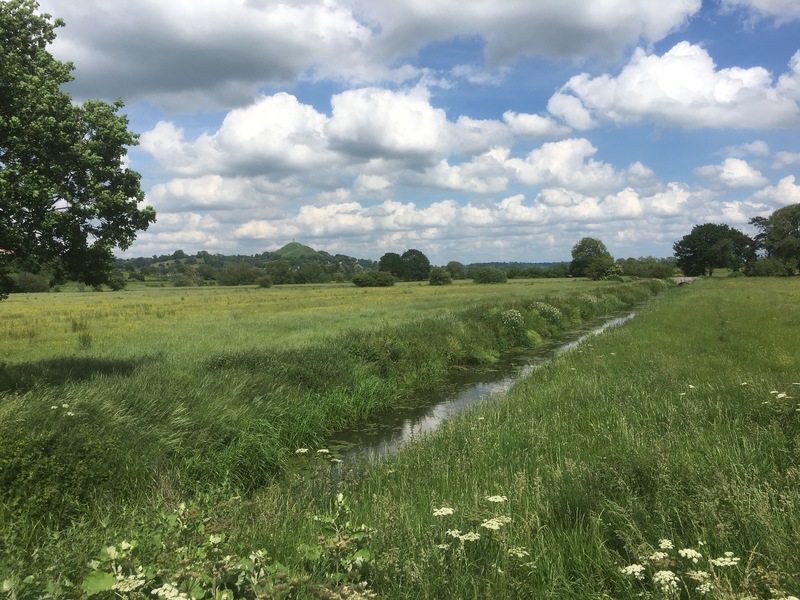 Finally, here’s a view looking back towards Glastonbury from just along from Pomparles Bridge, on the way to the next town over, Street. Legend has it that King Arthur, suffering mortal wounds after the battle of Camlann, gave the sword to his trusted lieutenant (either Bedivere or Griflet, depending on the version you’re reading), who took it down to Pomparles Bridge and, after a couple of attempts, cast it into the River Brue. The bridge itself today appears as nothing more than a road bridge across a fairly wide stream, even with a Pelican Crossing. You can lean on the fence though, fire up something medicinal, and let your mind wander to fiery skies, galloping hooves, and ancient coracles bearing away the King to Avalon, from where one day he’ll return, his wounds healed. ….and that’s a little of the magic of Glastonbury. A week of glorious sunshine, wandering hill and dale, reconnecting with nature and your fellow man. Few things can compare with lounging on Wearyall Hill on a blissfully hot day, the bustle of the town far below, birdsong and animal calls your only company. Treasures abound in the local shops, and if you like your beer, music, and some great people you don’t know yet, I heartily recommend The Riflemans Arms, The Hawthorns, and The King Arthur. The town, like everywhere else right now seems to be feeling the effects of austerity, which makes it all the more important to keep these places alive. Go see ’em. Till then may your Gods smile upon you and peace out.